Like Rodney Dangerfield, Pontiac's Fiero never seems to get any respect. I think it's high time it did and today's Nice Price or Crack Pipe 3.8-powered edition is a good way to start. You'll need to decide if its price is also respectable. Annnnnnnnd, we have a winnah! After a drought that would rival California's parched-ment yesterday's 1964 Buick Riviera came away with a 62% Nice Price win. Even in its arresting orange hue the original Riviera continues to get the respect a classic of its calibre deserves. The same can't be said however of one of GM's other famous rides. Look, we all love the Fiero, right? I mean sure, its underpinnings were sourced from cars like the lowly Chevette and gypsy curse that was the Citation. I'll admit that its base four-cylinder engine was derisively nicknamed the Iron Puke, and for good reason. I'll give you that. However, it was America's first mass-produced mid-engine car, the first with an innovative space frame topped with RIM plastic body panels, and with a V6 and 5-speed, the Fiero could more than just get out of its own way. Oh, and pop-up headlights, we love those! This 1988 Fiero GT is all that and a bag of supercharged chips. If any Fiero deserves respect, it's this one. First off, it's an '88 model, which sported a heavily redesigned, and vastly more competent suspension. Secondly, it's that V6 and Getrag 5-cog box that we noted wakes-up the car's performance. Lastly, it's a GT model which has revised lines from the base car and which are still quite handsome today. I should also mention that the V6 between the seats and the trunk isn't the sturdy, 140-horse L44 2.8. Oh no, this Fiero rocks a supercharged 3800 Series II. Booyah! That engine is described in the ad as having been a GM dyno unit, and was installed in the car by a previous owner, who coincidentally was a GM engineer. I wonder if they're still looking for it at the testing lab? With 240-bhp to its name, the L67 SC should open all kinds of new doors for this little Pontiac. The rest of the car looks awesome, in metallic burgundy plastic over a biscuit interior. There's a sunroof, and quite remarkable excellent visibility for a mid-engine car. The insides are equally as nice, featuring the stock stereo and console cap instrument pod. The main cluster has been switched for one from a Sunbird turbo for the boost gauge, but it looks right at home there. In addition to the Buick mill, the car has also had its battery moved to the nose, and there have been some suspension upgrades including Koni shocks, and some cool wheels. No word on how old those all are, but the ad does say that the car has 134,000 miles on the clock. This is a very respectable Fiero, and one that would gather adoring fans at any Fiero meet. The car comes with a Buy-It-Now Price tag of $11,500, and it's now time for you to weigh in on how much respect you have for the seller's pricing acumen. 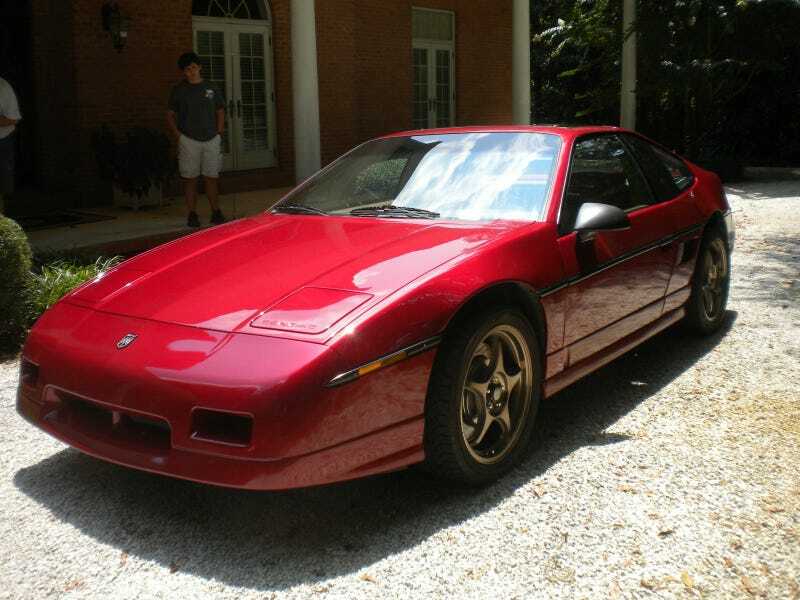 What do you think, is this 3.8SC-powered Fiero worth $11,500? Or, is that price disrespecting? H/T to SamVanH for the hookup!